From left: daughter Heather Hamilton, wife Marion Hamilton, and niece Carmen Komish after the unveiling Monday afternoon. Photo: Tim Kucharuk/CKRW. 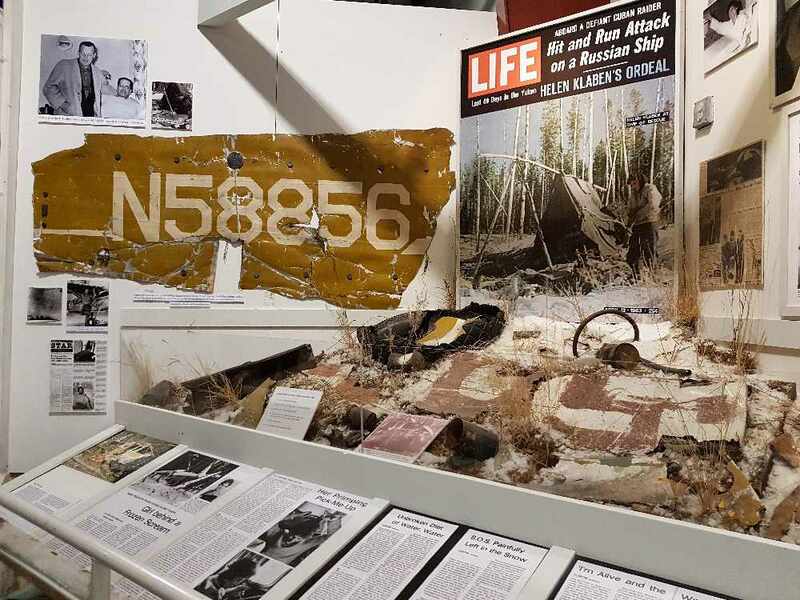 The family of rescue pilot Chuck Hamilton has donated an important piece from the Flores-Klaben plane crash of 1963 to the Yukon Transportation Museum in Whitehorse. 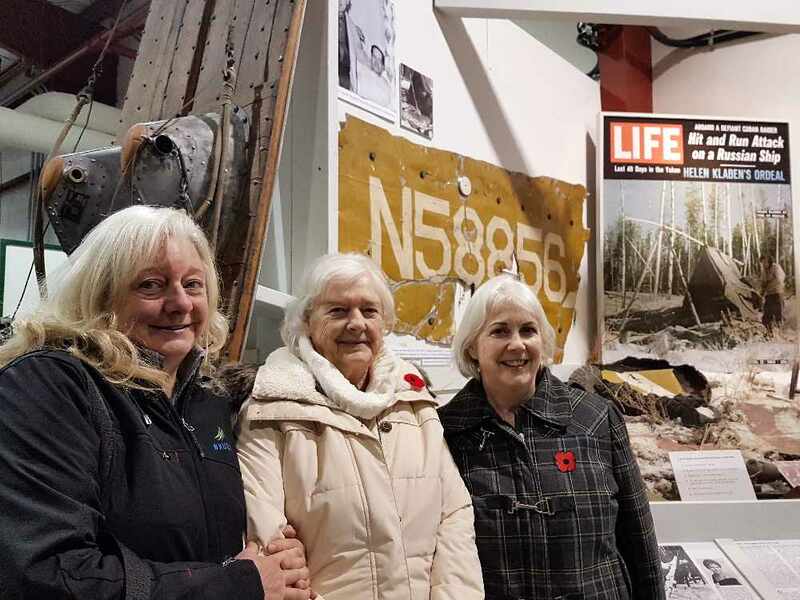 A piece of one of the most famous survival stories around is now on display at the Yukon Transportation Museum in Whitehorse. 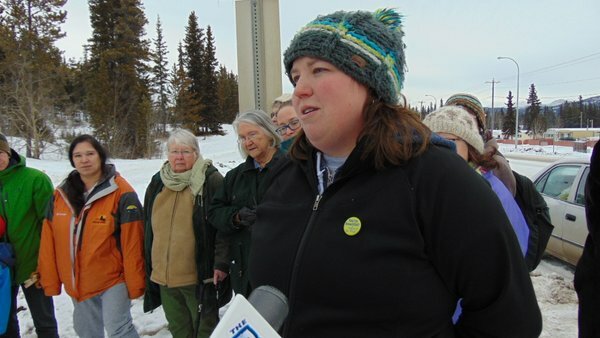 The registration-bearing fabric of the Flores-Klaben crash south of Watson Lake was unveiled Monday afternoon by the family of pilot Chuck Hamilton, who helped rescue the pair. Pilot Ralph Flores and passenger Helen Klaben were flying from Fairbanks to California in February 1963, when the plane crashed in a snowstorm south of Watson Lake. Klaben survived for 49 days in temperatures reaching minus 40 degrees Fahrenheit before being rescued by Hamilton and others after a passenger on a charter Hamilton was piloting spotted a huge SOS sign in the snow the previous day. Flores had stamped out the SOS as he walked to a nearby cabin. Yukon aviation historian Bob Cameron says the fabric was kept as a souvenir by Hamilton, but after his passing in January, the family decided to make the donation. "At the time that the hapless people were finally spotted--after seven weeks of surviving in the wilderness--it was this piece of fabric and its identification numbers that confirmed just exactly who these people were." Cameron said. The fabric will join other items recovered by Cameron from the scene 35 years later in 1998. "Part of the story is that all they had when they found themselves in this plight, all they had for survival gear was two cans of sardines, two cans of fruit cocktail, and a tube of toothpaste." "When we got there, the empty cans were still there, (and) we have the sardine cans on display amongst pieces of the wrecked airplane." Two of Hamilton's family members flew up from British Columbia for the ceremony.